Goalkeepers are the only players on the soccer field who get to use their hands without incurring a penalty. They even wear different uniforms than the rest of the players. This enables them to stand out to other players and officials and to protect themselves from injuries. The requirements for soccer uniforms are set by FIFA, the governing body of the sport. FIFA's Laws of the Game require all players, including goalies, to wear a jersey or shirt, shorts, socks, shin guards and footwear. Players are allowed to wear undershirts and undershorts, but they must be the same color as the outer garments. In addition to the basic uniform rules, goalkeepers must wear a jersey with colors that are different and distinguishable from those worn by both teams and the referees. This rule allows officials and players to spot the goalkeeper at all times, including during melees around the goal. It's OK if both goalies have jerseys that are the same color. In terms of optional equipment, you can wear shorts and pants made specifically for the goalie position. The shorts tend to be longer than regular soccer shorts, offering more protection when you dive to block a shot. Long pants designed for goalies offer even more protection, although you might feel that they slow you down enough to be a liability. Goalies are allowed to wear gloves, which are almost indispensable for a competitive goalkeeper. The gloves protect your hands, fingers and wrists from shots fired at long and short range, which can travel at close to 100 mph. Gloves for goalkeepers can feature a molded latex palm with flexible grooves and stitched fingers. Goalie gloves for kids' soccer, manufactured by such well-known names as Nike and Adidas, cost around $20. FIFA equipment rules are generally followed by college and high school soccer governing bodies as well. Some exceptions are dictated by age or safety considerations. For example, high school soccer players, governed by the National Federation of High School Associations, are required to wear shirts, shorts, shin guards and shoes that are an appropriate size for the age. Shin guards can be no higher than 2 inches above the ankles. FIFA allows equipment for goalies and other players for protective purposes that pose no danger to other players. 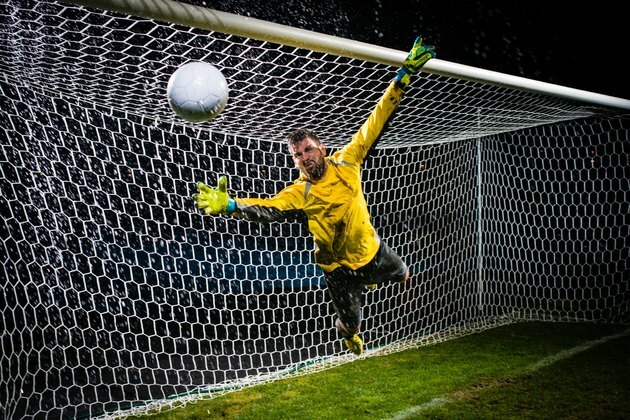 So headgear, face masks, eye wear and knee and arm pads that are made of soft, lightweight and padded material are OK.
Why Do Soccer Goalkeepers Wear Different Uniforms Than the Rest of the Team?